The often requested feature on the Windows version to select a default editor to edit files with regardless of the file type association set is now available in the latest snapshot build and will be part of the upcoming 4.1 release. 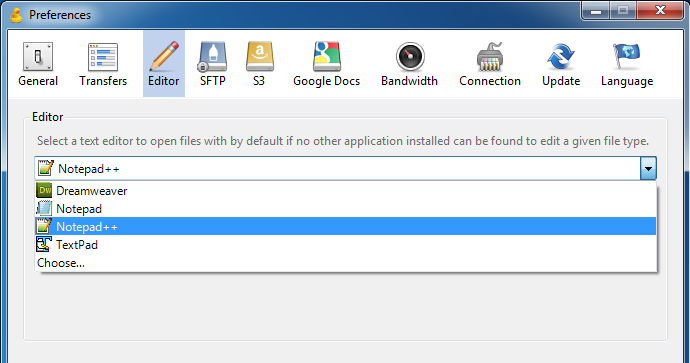 The editor functionality in Cyberduck allows to edit files live on the server with any installed application on your computer and uploads changes upon save. Ganymed SSH-2, the robust SSH implementation used in Cyberduck, is now maintained at Google Code and includes the optimizations patches that I have made for Cyberduck. Most prominently that is parallelism for downloads and uploads increasing transfer rates. WebDAV on the upcoming Lion release of Mac OS X will feature a more prominent role. 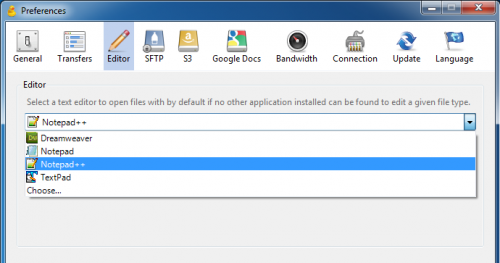 As a superset of HTTP, WebDAV adds support to retrieve a directory hierarchy and create, change and move documents therein. WebDAV is a core protocol supported in Cyberduck since 2008. To make it more robut and ready for the next couple of years I have decided to contribute to the Sardine project, an open source implementation of the WebDAV protocol that is now used in Cyberduck. You can test the new implementation in the latest beta build.